What should I look for in a piano teacher? When should my child begin piano lessons? 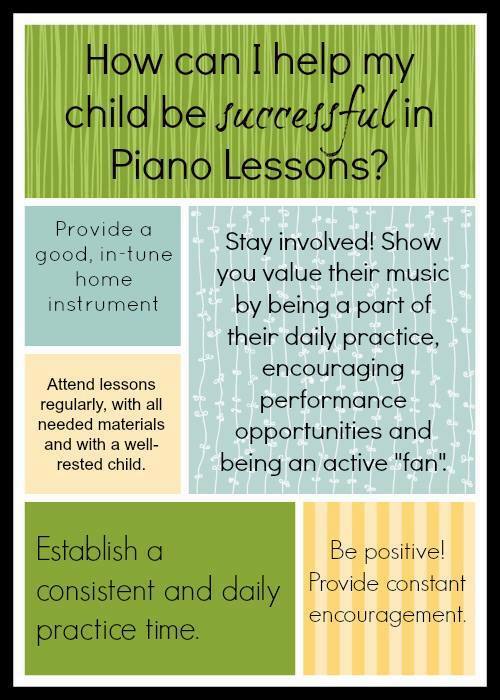 A child is ready for private piano lessons when he/she shows an intense interest in the instrument. They also need to be able remain somewhat focused for a 30-minute lesson. When should my child begin private voice lessons? A child who loves to sing and is interested in learning more is ready. Miss Shelley believes that voice lessons for a young child (elementary age) should be chosen with great care. The emphasis in pre-adolescents should be on teaching a child to breathe properly and support their sound in order to produce a natural, easy sound. Children should not be taught to sing in a way which sounds like an adult voice - this can actually be damaging to the vocal mechanism. At this age, children benefit greatly from singing in choral groups. An adolescent student is ready to begin lessons when an interest is shown in learning more about singing. Emphasis should be on building a vocal technique which promotes a natural, easy sound. Again, great care should be taken in choosing a vocal teacher to ensure that the vocal mechanism is engaged in a healthy way with no tension or pressing. What is required to begin lessons? Before beginning lessons, Miss Shelley meets with the prospective student(s) and parents for a free consultation. During this short visit, Miss Shelley becomes acquainted with the student's interests and personality. She also determines which books will be needed for instruction. Parents will be apprised of Miss Shelley's teaching philosophy and style, as well as further requirements as stated in the Studio Policy. When the students and parents decide they wish to begin lessons, Miss Shelley will order the appropriate materials and set a weekly schedule for lessons. During the time between lessons, students need to practice daily. Miss Shelley doesn't recommend that a certain amount of time is spent; instead, the items assigned for that week should be completed. A practice instrument needs to be available. An acoustic piano (kept in tune) is best, but an electronic keyboard with weighted action and at least 61 keys will suffice for beginning students. What sort of instrument do we need for practice at home? How long should a student's practice period be?